For most of us, the idea of eating raw garlic likely brings to mind images of horrific unpleasantness. After all, it’s one thing to saute it, quite another to bite into, chew up, then swallow an uncooked garlic clove. But that’s exactly what I do whenever I feel a cold or flu coming on because it really works. Garlic is nature’s antibiotic…. it can stop a cold or flu dead in its tracks. Using garlic to treat respiratory, digestive and other health problems is a medicinal practice that dates back more than several thousand years to ancient Egyptian, Greek, Indian and Chinese cultures. Today, alternative doctors still rely on garlic to prevent high cholesterol, high blood pressure, heart disease and to lower blood sugar. It’s also used treat colds, ear and yeast infections, sore throats, asthma and congestion. There’s even a study at the National Cancer Institute in the U.S. that suggests garlic can slow the growth of cancer cells and cause abnormal ones to self-destruct. So how does it work? Unlike blackstrap molasses, whose efficacy comes from being loaded with tons of healing nutrients, garlic’s potency comes from a compound called allicin that’s only produced when the bulb is crushed or chewed up. The compound works by stimulating the body’s immune system to fight off cold or flu bugs, but it can also kill a slew of different viruses and bacteria on contact. The key thing here is that garlic must be raw in order to be potent… it loses most of its healing power when cooked. Next time you’re sick, and wondering whether to take the plunge and chew on some garlic or default to conventional meds, consider this: according to Paul Bergner in The Healing Power of Garlic, some traditional antibiotics may not be as effective as garlic and may destroy the good intestinal flora. As for my two cents, I used garlic to fend off a cold before it set in. I came home and suddenly started sneezing and developed an itchy throat and post-nasal drip. So I chewed on a raw garlic clove and swallowed it. I did it again an hour later and went to bed. When I woke up the next morning all my symptoms were gone, and I felt fine. I’ve done this effectively before on several other occasions too. 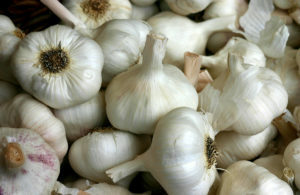 Simply use crush up a single clove of garlic into bite sizes, then swallow it like a pill. Chase it with juice or water. You’ll feel the burn as it goes into your system. That’s the allicin compound killing the itchiness or soreness in your throat along with any other viruses or bacteria. Repeat that dose if needed. Before you try this, be sure to consult with your doctor first. Also, please share your own natural cold and flu or garlic remedies with me, by commenting below.